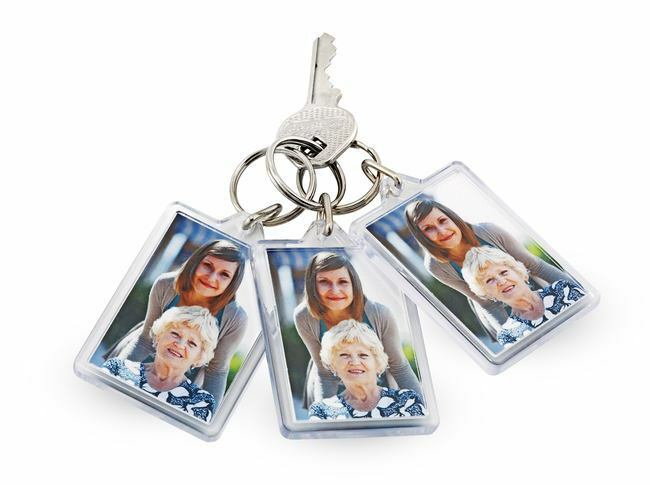 Keep that special moment with you on a personalised photo keyring. So easy to order, delivered quickly as well. Couldn’t be happier with them. My order came super fast & the keyring turned out fab. The picture was on both sides which I was delighted with. Thank you for making it super easy to treasure fond memories! My photo keyring looks great. I ordered it last minute before Christmas so was reassured to get lots of informative emails about its delivery. It arrived late the night before Christmas Eve 9.40pm so I felt sorry for the delivery man but delighted to get my product. I ordered one last year and will again last year. Don't even hesitate to get these they are excellent! At about €3 per key ring delivered to your door in the blink of an eye you can't do better than that! Really nice and really fast! 10 out of 10 guys thank you very much. Can't believe how quickly I got these into my hands from ordering. I will happily recommend you to everyone and anyone. ps - I did load the picture the right way up but it got turned upside down after it uploaded - feel free to spin it around. Anyway, thanks again I am a very happy customer. Glad that they were a set of three as my daughter loves them too and so has lost one already. New found love for my keys. I order personalised keyrings as party favours and was all the guests were thrilled with their keyrings. The quality was exceptional and ordering was very easy! Would highly recommend!! Have ordered a few different sets already, Great quality. Great quality, Have ordered them a couple of times. Excellent service, ordered Wednesday night, received Friday lunch time. Great quality. It’s the third set of key rings I’ve gotten and it’s great quality. They are really durable so I’m not worried about them being broken especially as I tend to throw my keys around. The only thing is I wish there was an option to print a different picture on each keyring as you get a set of three and I don’t particularly need 3 of the same picture but other than that it’s an amazing product and I will be buying again ! Easy to order and arrived in record time. I would have liked to have had a different design on the back but this option was not available. It's a great product and I'm absolutely delighted with how they turned out. I love this product, the key rings turned out really well, exactly as I wanted. They key rings are quite sturdy as well and the pictures are completely protected from wear and tear. 10/10 for the product and for the price ! I'm very pleased with the delivery and quality. Thank you! Review by: Anne Marie H.
Super fast delivery, great service, thanks for getting it in time for Christmas! Very happy with the product. Good quality and price and fast delivey. Super fast delivery, looks great,very happy. Nice quality product. Brought a smile to my face when I saw them so I'm sure others will no doubt find the same with their buys. Keyring looks just as advertised - photo looks really clear and it was delivered within days. I`m really pleased with the keyring and would order from Pixa Prints again. Well done & thank you guys!